Ever since I got my Windows 8 PC, I have been having serious problems with audio. Basically all sound playback on my system experiences a brief but frequent click, skip, glitch, stutter, whatever you prefer. I can reproduce the issue on any sound card or firewire sound interface (devices tested include the onboard Conexant SmartAudio HD, my external Phonic Helix 12, and my Edirol FA-101). All of them seem to have audio clicks, with the firewire interfaces' clicks seeming more harsh for whatever reason. At first, as an audiophile, it was just hugely obnoxious - but then I realized it was also an issue on recordings made via my sound interfaces. This, to a home recordist, is more than just a serious problem, it's a deal-breaker. After I got done grumbling about how Microsoft took a great thing (Windows 7) and "fixed it", I got down to business trying to figure out exactly what was causing this issue. I found out the glitch is very easy to isolate when listening to a study tone. I used a tone generator plugin in Reaper. The click happens about every 5-10 seconds... Never more than 12 seconds apart. 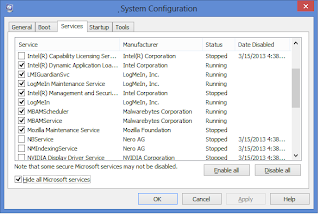 Next I used msconfig to pare down the suspect services. Later I determined that MBAM website blocking seems to be more specifically tied to the issue. 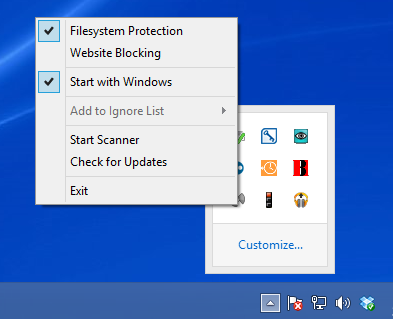 By disabling startup services in progressively smaller groups and rebooting a lot, I finally narrowed it down to Malwarebytes, my anti-malware protection tool of choice. Specifically, the issue goes away immediately when I disable the website blocking feature. So of course, on one hand, I'm pretty happy. It means I don't have to reformat my computer and start all over. 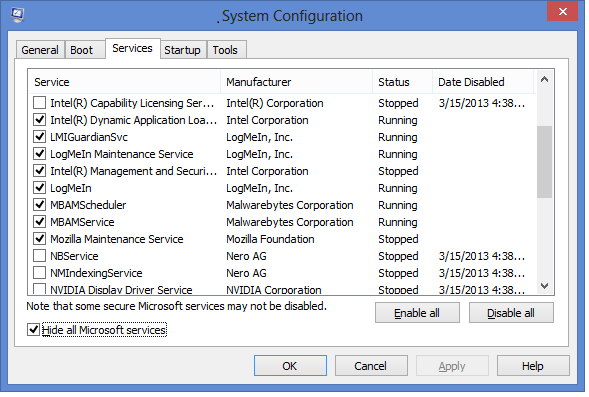 On the other hand, I do have ask the question, why was this never an issue until I started running Windows 8? I've been an MBAM user for many years. Clearly there is some kind of minor compatibility issue between MBAM and Windows 8. I wonder how long it will be before this is figured out. In the meantime, it looks like I'll have to remember to disable website blocking before I start a recording session. Anyway, I hope this post saves someone who is experiencing a similar issue some time. Lord knows I found a TON of Google results for the keywords "Windows 8 audio click"... Mostly forum posts by people looking for help, and I saw very few resolutions. My bet is that a bunch of those are people running MBAM. I'm using Win7 and had the same problem. Fortunately Malwarebytes was the only program I had installed just before the problems started, so it was pretty easy to determine the source.